Arsenal have defended the cost of their match tickets after the BBC's Price of Football survey showed they had the most expensive in the Premier League. 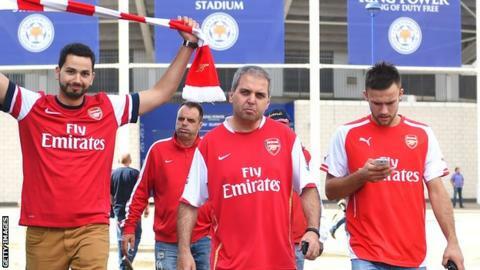 At Thursday's AGM, chief executive Ivan Gazidis said ticket prices had gone up below the rate of inflation and wages. "The board has never approached ticket prices glibly or lightly," he added. But Arsenal Supporters Trust member Tim Payton said pricing promises had been broken and warned the club were "breaking the loyalty bond" with fans. Arsenal's most expensive match-day and season tickets are £97 and £2,013, with the cheapest coming in at £27 and £1,014. The Price of Football study reveals that Arsenal's £97 ticket is more than double the most expensive match-day ticket at seven other top-flight clubs, despite being reduced by £29 on last season. The side's £2,013 season ticket is double the price of Manchester United's most expensive ticket and more than four times the cost of West Brom's. Pressed on the issue at Arsenal's AGM at the Emirates Stadium, Gazidis said ticket prices have increased at a rate of 1.3% since 2006, which was below the growth of players' wages, fans' wages or inflation. The 50-year-old said: "Demand for tickets continues to far exceed supply. Underneath those headline ticket prices, the club continues to make tickets available to as many as possible." Gazidis, who was appointed Arsenal's chief executive in January 2009, added: "We make responsible and reasonable decisions. We understand the pressures. We have tried to take a balanced and sensible approach to competing pressures. We have relied mostly on commercial and broadcast increases to compete at the level we demand. "Our ticket exchange continues to grow and it's the most advanced in the game, 60,000 will use it this season. That continues to remain a priority for us. We are always looking at initiatives." Arsenal Supporters Trust (AST) member Payton was present at the AGM and said Arsenal fans were "disappointed" by the response from the Gunners' board. Payton told BBC Radio 5 live: "The point he (Gazidis) made was that the commercial income had gone up by over £100m in the last three years and the ticket income had hardly gone up at all. "But he conveniently forgot that three years ago he promised us that when the commercial income went up he would take the pressure off ticket prices. "It is just breaking that loyalty bond between the club and the fans." Gazidis also went on to reject the idea the club are sitting on "tens of millions of spare cash", as suggested by the AST, which they refuse to give to manager Arsene Wenger to spend on players. "There is an inaccurate analysis about cash available. We are not hoarding a vast cash balance. We do not try to broadcast our cash situation, but the situation is more complex," Gazidis told fans and shareholders. Arsenal spent around £60m in the last transfer window, the second highest amount in Europe, as they recruited the likes of £35m Alexis Sanchez from Barcelona and £16m Danny Welbeck from Manchester United. "We do try to keep a reasonable amount for the transfer budget," Gazidis added. "It is quite untrue that we are sitting on a huge cash pile for some unspecified reason." Arsenal boss Wenger later confirmed that he would be looking to spend in the January transfer window and would focus on strengthening his defence.